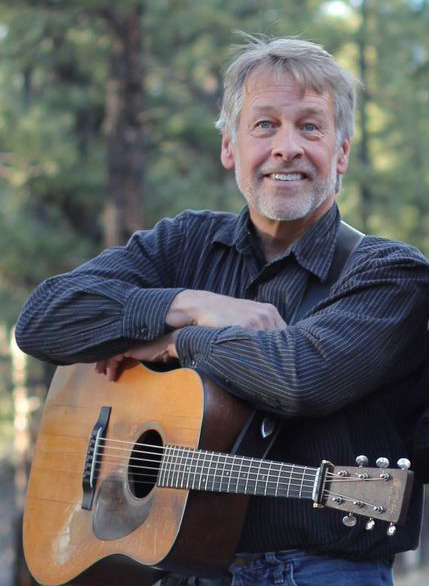 Peter McLaughlin is an acclaimed acoustic guitarist, songwriter, vocalist, performer, recording artist and music instructor located in Tucson, AZ. He plays many genres and styles, and specializes in acoustic flatpicking and fingerpicking techniques. He was born in Washington DC, and his family’s roots are in Scotland and England by way of Virginia, West Virginia and North Carolina. Early on, his parents, Bill and Nancy McLaughlin, brought music into the lives of Peter and his brother David. They were introduced to all types of music, had a family band, and were surrounded with love and encouragement. Peter started playing the guitar at the age of eight and was very soon jamming at bluegrass festivals and fiddle conventions. He lived in Denmark in the early 70s, and attended a Danish high school. In 1974, Peter moved again, this time to attend Northern Arizona University in Flagstaff, where he played with Tom Rozum (mandolin, fiddle, and vocals), Roger Smith (bass and vocals), John Zarske (rhythm guitar and vocals), and Frank Dedera (banjo) in the group Flying South, an acoustic string band specializing in bluegrass and early swing era jazz. A later incarnation of Flying South included Kirby Mittelmeier (mandolin and vocals) and John Willis (bass and vocals). In 1983, Peter moved to Tucson, where he played music with banjo player Ross Nickerson in various bands, including the 1988 Telluride Band Contest winners, The Titan Valley Warheads, who Peter still plays with on occasion. In 1991, Peter had the opportunity to reunite with his long-time pal, Tom Rozum, and joined Laurie Lewis, touring nationally and internationally for six years as guitarist and harmony vocalist with her band. In 1992 Chris Brashear moved to Tucson. He and Peter struck up an immediate and lasting friendship and a strong musical bond and began performing and recording together. In 1996, Peter released his first solo album, a CD entitled Cliffs of Vermilion, produced by Laurie. She, along with Tom, Chris, brother David, father Bill, and others appear on Peter’s stellar debut CD, which is on Dog Boy Records. In 1999 when Chris recorded his first solo CD, Wanderlust, an excellent new bluegrass band formed out of that project when producer, Jody Stecher, along with Bluegrass Boy banjo picker, Bob Black, bassist, Forrest Rose, Chris and Peter started Perfect Strangers. Their self-titled CD, released on Rebel Records in 2003, was also produced by Jody. Since the late 1980’s Peter has performed off and on with Bob Meighan, Earl Edmonson, Kirby Mittlelmeier and Brian Davies in a band affectionately known as The Dreadnutts. In 1991 they won the Telluride Bluegrass Band Contest. In 2011 Peter’s current band, The Sonoran Dogs, was formed out of a tour with the late Japanese guitarist, Maro Kawabata. The “Dogs” continue to perform regularly at various festivals and concert venues. Their first CD was released in 2014 on Dog Boy Records. In 2013 Peter was inducted into the Tucson Musicians Museum.